For the past few days I've been trying to copy and also improve on the qpGraph tree in the Wang et al. preprint (see here). I've managed to come up with a new version of my model that not only offers a better statistical fit, but, in my opinion, also a much more sensible solution. For instance, the Eastern Hunter-Gatherer node now shows 73% MA1-related admixture, which, I'd say, makes more sense than the 10% in the previous version. 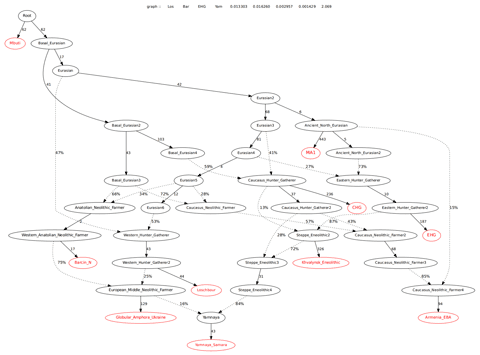 The relevant graph file is available here. Samara Yamnaya can be perfectly substituted in this graph by early Corded Ware samples from the Baltic region (CWC_Baltic_early) and a pair of Yamnaya individuals from what is now Ukraine. This is hardly surprising, considering how similar all of these samples are to each other in other analyses, but it's nice to see nonetheless, because I think it helps to confirm the reliability of my model. And yes, I have tested all sorts of other Yamnaya-related ancient and present-day populations with this tree. They usually pushed the worst Z score to +/- 3 and well beyond, probably because they weren't similar enough to Yamnaya. But, perhaps surprisingly, Bell Beakers from Britain produced a decent result (see here). So, who was the PIE: Eneolithic_Steppe or Globular_Amphora? Globular Amphora-related admix in Yamnaya and Corded Ware is female mediated, so it can't be the PIE signal. PIE is wherever the recent Yamnaya-like ancestors of Ukraine_Eneolithic I6561 came from (because they weren't exactly native to eastern Ukraine); probably somewhere around the Sea of Azov/Don River. In other words, the Sredny Stog II/Khvalynsk horizon. The rig veda is a well known searchable text. can you please point to verses with dog sacrifice or dog tooth necklaces. So is the "Reverse Cheshire Cat Smile" of Eastern IE expansion very viable indeed? "PIE is wherever the recent Yamnaya-like ancestors of Ukraine_Eneolithic I6561 came from (because they weren't exactly native to eastern Ukraine); probably somewhere around the Sea of Azov/Don River. CWC-developing groups move into Central Europe/Baltic from somewhere in the Yamna horizon (while other Yamna groups enter via Danube basically). While a variety of Yamna origin (as above) groups do their thing(s) elsewhere. The CWC_baltic however is really interesting. It has really different proportions of EMNF and SE4. AND SE4 itself has a different mix --it does not pull from CHG2--but looks to be more basal than that. Further it has a much greater difference from the Yamnaya cluster. All of which suggests that CWC-Baltic is related to Samara and Ukraine but is likely getting additional ancestry from a different (though related) source. Seems to logically flow based on all the data collected so far. I am far from an expert with these tools, but the only relationship that looked odd was the Armenia_EBA on their "steppe" related inheritance. I suspect ANE was the best fit because we don't currently have the data behind this mixture, and it is obviously not any of the "steppe" sources we have right now in this model. “PIE is wherever the recent Yamnaya-like ancestors of Ukraine_Eneolithic I6561 came from (because they weren't exactly native to eastern Ukraine); probably somewhere around the Sea of Azov/Don River. It is a little bit confusing because in the papers they write about Yamnaya culture, not Yamnaya-like steppe component like you. Yamnaya-like component can be obtained in many ways: for example I can imagine Dnieper-Don-Volga EHG rich populations importing CHG rich Caucasus wives familiar with farming. Yamnaya culture is a specific material culture which can be associated with specific language. I was asking about PIE because if Yamnaya culture originated from Eneolithic Caucasus Steppe and GAC it probably was not PIE. 5. IE Yamanya +not-IE Anatolian/Caucasus farmers¬> Hittitie etc? We don’t know what really happened yet. But it doesn’t look like merging of two cultures HG/Steppe and Farmers on equal terms. It looks more like HG or Steppe men were buying farmers daughters. Farmers have to control the population they feed and in times of bad crops they have to get rid of young women who can have children to prevent overpopulation and hunger. In bad times farmer women can be really cheap and affordable to HG and Steppe men. Because they control a lot of land, introducing farming opened unlimited resources for them. They could have a lot of children. If this was the case then farmer women were gradually introduced to new society and had to adjust, learn language etc. Therefore I think steppe language was dominating and was pre-PIE. But I have no doubt that high culture of CT women influenced PIE Sredny Stog II culture, religion and to a lesser degree language. Therefore I think PIE language and culture proper, which influenced India and Greece later and is responsible for many similarities in religion, philosophy etc., originated as a result of interaction of SS II steppe pastoralists and CT/GAC farmers. think about that....probably CT and GAC and other farmers related cultures ( let's call them the EEF+WHG peoples ) were a big stuff they probably communicated with a lingua franca already in the areal zone from lisbon to kiev....so it was not just cucuteni....my take PIE was not an ethnic language but lingua franca that surely originated in same particular culture ( it could be LBK or Cardial and Epicardial we do not know ) it was a quasi-english of the neolithic....that would easily explain the incredible success this language had.... in the time 4500/3000 people of the steppe were acculturated by CT and Balkan-carpath metallurgical complex and switched from an HG language to IE. Then what happened? Something not unusual in history....the old farmer world underwent decay...low fertility rates...internal conflict ( the growth in size of protocities in CT is a sign in this direction ) and finally it became target of a big migration of younger and more" hungry" people that searched for glory and opportunities in the lands of their ancient masters...it is no coincidence that we do not have much signs of conflict in europe between farmers and invading R1b R1a people...on the contrary as I said many times before, steppe tribes eagerly adapted to many cultural traits that were typical of the farmers world ( among them flexed burial, cremation, sun cult etc. etc.). So you don’t see beakers as Yamnaya +globular amphora David? The BB Brits have an interesting effect on the graph. Unsurprisingly they pull more EMNF than Samara. But what is interesting is the effect they have on the Steppe Eneolithic ghost populations. The CHG2 population is much further drifted in the Brit than the Samara and the SE2 population is brining is more to the mix to the SE3 population for the Brits than Samara. Could suggest two different sources of CHG-like heritage is coming into the Brits than you see in the Samara or CWC_baltic for that matter. Could you be seeing some CHG coming into them from a Steppe independent source? Maybe the same CHG source that went into the Minoan or Remedollo populations? He's talking about the large scale migration from third world countries into western europe that's been going on in recent years, I'm surprised you haven't heard about that. That RSPB paper on Globular Amphora has the worst PCA of ancient West Eurasia that I've ever come across anywhere. It doesn't make any sense. I have no idea how it got through peer review. My graph shows the British Beakers as deriving directly from Yamnaya. That's likely to be an oversimplification, because they probably have farmer ancestry from west of the steppe, but I think it's mostly correct. So I'm not sure why you're asking me that question? I suspect that Armenia_EBA (Kura-Araxes) has some Steppe Maykop ancestry, and thus some sort of Botai-related admixture, so the MA1-related mixture edge in my graph might be compensating for that. I haven't looked as closely at the British Beakers, but I think it's a good bet their ancestry is also somewhat more complex than that of Yamnaya. Well your baltic results are consistent then, cool. Forgot about that post. But it is nice to see how qpgraph can show differences in heritage from related populations. In your response to mike, i do not think it is farmer ancestry that is different. That side of the graph did not really change. It "flexed" on the steppe side suggesting change is coming from that side of ancestry--not that it could not be a farmer population with some steppe like heritage..
What did CWC from germany look like or Netherlands they seem to be the primary replacement population for Britain in the bronze age. That paper gives some credence to their references 8&9. They should be ashamed of using those papers, They are objects of ridicule. Armenia EBA has assimilated some Steppe ancestry from Armenia CHl who's origin is not yet clear. But it is very unlikely that it comes from Maykop. Because Maykop Caucasus didn't have any Steppe/ANE/Siberia only Maykop Steppe had it. And I have no idea how Maykop Steppe could jump over the heads of Maykop Caucasus and Dolmen culture and have an impact on KA. Just visually from the PCA , Armenia Chl looks like a mix of Hajji Firuz Chl and something slightly more eastern than Ukraine Eneolithic and more western than Yamna. The beginning of mobile populations, marked by kurgans and the contemporaneous building of walls at Shengavit, Mokhra Blur (23, 28, 29), and Ravaz (48), is already evident in the early third millennium BCE. 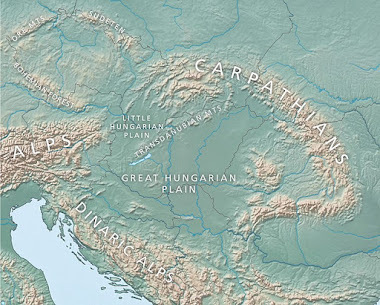 Ultimately, in the homeland, the Kura-Araxes adaptation would be displaced by a more mobile and militaristic one associated with the so-called Kurgan Cultures (15, 49). This isn't contradicted by the data in the Maykop aDNA paper. In fact, there's support for it in the finding that there was a cultural and genetic border between the Caucasus and steppe groups that shifted back and forth until Yamnaya moved right up to the Caucasus foothills and Maykop disappeared. So it's possible that Maykop and Steppe Maykop moved south as part of this process of trying to escape the steppe people. If so, this might explain steppe ancestry in the Near East that isn't specifically linked to Yamnaya and Andronovo. The Majkop culture isn't a northward extension Kura-Araxes - as the two cultures are distinct and only partly contemporaneous. In fact, K-A is significantly younger than Majkop by hundreds of years, therefore the latter cannot be a northward extension of the former. Secondly your quote has no relevance to Majkop, as you're speaking about the movement of groups in the late M3 and the establishment of Bedeni and Markopti kurgan groups. I know you often on your blog make the statement that steppe people overran Majkop groups - never being able to actually produce a quote for this other than stating "Russian scholars said so'. In fact, these Russian scholars, co-authors of the great paper by M.P. point out that Majkop ended due to the expansion of K-A, the latter possibly cutting off its contacts with the south, and ultimately the collapsing Uruk society which sustained much of Majkop's trade, but also possibly due to Majkop expansion into Anatolia & further west. After c. 3000 BC, there is a northwards expansion of K-A, and only much later, c. 2200 BC is there an expansion south of actual steppic groups , which of course lies in the Catacomb period. David, sorry, I still don’t understand that Yamnaya = PIE equation. Where did Steppe_Eneolithic4, which was a mix of Khvalynsk_Eneolithic-like Steppe_Eneolithic2 and CHG2, got Globular_Amphora_Ukraine-like European_Middle_Neolithic_Farmer component if not from Sredny Stog? Steppe_Eneolithic4 from which early Yamnaya formed was probably located somewhere around Volga river very far from where GAC or Tripolye existed. If GAC-like component was obtained from Sredny Stog, then who was PIE: Sredny Stog or Steppe_Eneolithic4 and Yamnaya? Not that I really care, to be honest, but Maykop and Kura-Araxes people being pushed south by Kurgan people does make a lot of sense, especially in the light of the new aDNA evidence. Well, what are you going to say when it's finally shown that Corded Ware is just a subset of Yamnaya? Well you should care & be more clear. Kura-Arax 3300 - 2500 BC. The move south of steppe people to south Caucasus exactly corresponds to the 4.2 kiloyear event - the peak aridification of the steppe, and they seem to have mixed in with local groups. Okay those all make sense. Beaker netherlands and iberia look really similar--more influx of farmer ancestry than CWC so maybe local farmer mixture or Iberia-beaker at low levels--showing a possible flow of Beaker culture from Iberia into local Corded Ware peoples. Not a lot but some--enough to increase farmer ancestry by 10-12%? Maybe a low influx of Spanish women? Or males carrying the R1b haplogroup? Where did Steppe people go during the 5.9 Kiloyear Event ? Anybody know how to contact Ian Logan? The email he provides on his site is shut down. David: So it's possible that Maykop and Steppe Maykop moved south as part of this process of trying to escape the steppe people. If so, this might explain steppe ancestry in the Near East that isn't specifically linked to Yamnaya and Andronovo. > Should be pretty easy to test in qpadm when the Wang et al genomes are released: does any combination of Maykop/Steppe_Maykop provide a better "northern" proxy for Haji_Firuz_BA than Steppe_EMBA? By the way, I'll be deleting all comments by people with the nick "Unknown" from now on, because it doesn't make any sense to have several different people posting here under the same ambiguous nick. Anybody gonna finally do a Y DNA analysis of the Narasimhan 2018 genomes!! I think we'd all like to see the supposed R1b M269 samples from Iran & Afghanistan analysed, see all the kinds of Z93 Andronovo had, etc. If you're not able to please ask someone you know who is able to. Well it's kinda difficult when the BAM files are still under embargo, no? Oh, I didn't know that. Is it possible to get the mtDNA and phenotype SNPs. If you're reading this, how do you feel about regularization in nMonte3, especially in relation to using ancient reference populations? Do you think it's possible to give the Darra-e-Kur sample a spin in Global_25, as well as Iran_Hotu? "By the way, I'll be deleting all comments by people with the nick "Unknown" from now on, because it doesn't make any sense to have several different people posting here under the same ambiguous nick." That was me, and I have no idea why "Unknown" appeared. You have to log into gmail to post, and I think something went haywire there. Anyway, the D-stat shows that even if Hajji Firuz was properly dated to the Chalcolithic, it still had steppe ancestry. I have no problem for accepting Northern Maykop related input into Kura-Araxes if I see such a evidence. This will not change much the status of Kura-Araxes anyway. The same is true for Armenia Chl. The presence of some northern input ( imho absolutely unrelated to Maykop's ANE/Siberia stuff ) in Areni doesn't make this site with jar burials an IE culture automatically. What imho will matter is what type of Steppe input will have or will not have ancient IE Anatolian speakers in Near East. Thanks brother! I greatly appreciate everything you do. I'll make sure to give those a spin (probably tonight). But, going by just a quick glance at the coordinates, they seem to look as one would expect. Off topic: In a first, an early Bronze age chariot has finally been found in UP, India. Is it possible to test phenotype snps and mtdna? I suppose a lot of the usual phenotype markers are in the 124K SNP dataset, but I haven't checked. Don't know about mtDNA, because I only ever keep data from chromosomes 1-23. Most recent papers don't provide mtDNA information other than assigned haplogroup (which might be unspecific or wrong). If anyone is willing to gather mtDNA data from any recent paper speak up. SC Asian mtDNA from Narasimhan 2018 especially would be interesting. Its first large collection of IranNeo-related ancient mtDNA. "In the RV the oath brotherhood of warriors that performed sacrifices at midwinter were also called dog-priests. The ceremonies associated with them featured many contests, including poetry recitation and chariot races. 48"
vrAtya means keeper of vow of abstinence/oath etc... They need not be warriors and were never called dog-priests in the rig veda. No verse is quoted or reference. this cryptic obscure story is bundled and juxtaposed with actual dog bones from Sintashta in a misleading pop cult manner. Good idea re;examining Iran_Hotu in G25 in light of new papers, Sein. Doesn't quite look like Iran_Hotu is really intermediate the Iran_N and AfontovaGora3, although this indeed looks to be a better match than intermediate Iran_N and West_Siberia_N / Iran_N and EHG? Linguistic links about PIE North Caucasian contacts. Are there more Proto-Kartvelian like words or characteristics in Hittite than there are in other Indo-European Languages ? My understanding of your question is that you ask how I feel about disabling the penalization, especially in models with ancient pops. By default nMonte3 regularizes/penalizes distant admixtures. The idea behind this regularization is that sometimes it is advisable to sacrifice some accuracy in order to avoid overfitting. If nMonte is used for exploration of a large reference sets, the risk of overfitting is considerable. Disabling the penalizing is equivalent to the assertion 'My models are not overfitted' and in this situation I think this unwise. The other extreme is when nMonte is used for hypothesis testing of a model with only a few non related pops. In this case the risk of overfitting is small and may not be worth the loss of accuracy. But it should be be kept in mind that the (slight) penalization can only become effective if nMonte finds less distant samples which fit nearly as well. My feeling is that in general disabling the penalization is not advisable, but in some situations it may be permissable, depending on the risk of overfitting. 1. What happens when you try to include Hotu_HG into your qGraph? May it yield some kind of name for the yet unnamed Caucasus_HG2 (or any of these Caucasus_Neolithic_Farmers 1-3)? What about Haji_Firuz_LN (I hope the CHG mislabelling will be removed in the final version) in this respect? 2. Do you also have Global25 coordinates for BellCave_HG, which is geographically located close to Hotu Cave, though from a slightly different period? Would be interesting to compare both against each other, as well as with later samples from Iran. Hotu_HG doesn't have enough markers and quality to be reliably analyzed in such complex qpGraph trees. But this individual is essentially a less basal version of Ganj_Dareh_N, and neither Yamnaya nor Khvalynsk really have this type of ancestry. They have ancestry from something from the Caucasus that is closely related. Haji_Firuz_ChL is also irrelevant because it has a lot of direct Anatolian farmer ancestry that Khvalynsk and Yamnaya lack. Actually, Yamnaya does have Anatolian farmer ancestry, but as per my qpGraph tree, this was acquired indirectly via gene flow from early European farmers and/or their descendants, like Globular Amphora. I know that a lot of people think and hope that Yamnaya has recent ancestry from what is now Iran, but this is essentially a misunderstanding based on a lack of ancient samples from the Caucasus and the southernmost parts of the steppe, as well as a rather poor understanding of all of the currently available data. "Doing a quick trick of reprocessing through PCA (removing African variation) and doing a dendrogram: https://imgur.com/a/mRm2tGH"
Thanks for the visualizations/analyses! As always, very interesting. "Doesn't quite look like Iran_Hotu is really intermediate the Iran_N and AfontovaGora3, although this indeed looks to be a better match than intermediate Iran_N and West_Siberia_N / Iran_N and EHG?" Honestly, I think that we might be lacking a good handle on the non-BEA ancestral streams involved with CHG/Ganj_Dareh/Hotu_HG/Sarazm_Eneolithic/Shahr_I_Soktha_BA2. Regardless, I do think we can figure this out, once we see Upper Paleolithic and Mesolithic aDNA data from Central Asia, and once we see further sampling of the Iranian plateau and the Caucasus. That being said, one fact seems to come out quite strongly, just by looking at the current data. Mainly, there seems to have been considerable differentiation between all of the various ancient populations which fell along different clines involving "ANE/West_Siberian_N/EHG" and "BEA" (of course, we are speaking in very broad terms here; none of these samples are "just" ANE/West_Siberian_N/EHG + BEA. I guess there is something "more" to all of them). For example, when it comes to the western geographic range for these populations, it seems that Ganj_Dareh was quite distinct from Satsurblia. And looking at the opposite end of the Iranian plateau, Hotu_HG seems to have been distinct from Sarazm_Eneolithic, while both were readily distinguishable from Shahr_I_Soktha_BA2 (this would still have been the case if the latter sample wasn't around 10% AASI; the West Eurasian ancestral stream for that sample is quite "unique". Personally, I think 90% of this sample's genetic ancestry, and thus nearly all of it's genetic ancestry, is traceable to some sort of Mesolithic West Eurasian group which may have existed in what is now Afghanistan). Anyway, seeing Darra_I_Kurr is also quite exciting, since it gives us a good idea concerning how ancient Bronze Age Afghan populations stacked up; Darra_I_Kurr for the northeastern quadrant, Shahr_I_Soktha_BA1 (Jiroft) for the southwestern quadrant. Would be nice to see ancient Afghan samples from the center, and from the eastern highlands. The reason I ask is because, until just recently, I've always disabled penalization. I wanted to have identical output to nMonte1/2, but with the speed that came with nMonte3. But for the last few weeks or so, I've been running nMonte3 with penalization, and have often been surprised by the differences. In many cases, results with penalization are far more sensible than results without it. But in other cases, disabling penalization leads to much more reasonable output. This puts me in a bind when it comes to making a decision on which route I should consistently be taking. I feel like a solution is needed for overfitting, and penalization is a step in the right direction, but perhaps we need something more comprehensive. The problem you mention is that sometimes disabling penalization appears to lead to a more reasonable output. This phenomenon is not typical for ancient samples, it happens with modern samples too. The idea behind regularization/penalization is that a great variance of the estimate is worse than a low average accuracy. The effect of regularization is that the variance of the estimate is reduced, but this does not imply that the regularized estimate is guaranteed to be always more accurate than the unregularized estimate. Apart from mathematical considerations, my experience is that unless you use a very simple model, not regularizing frequently introduces oddball admixtures. Unfortunately regularization does not consistently protect against unsatisfying results. I don't think that is a result of imperfect regularization, but of the very unfavorable statistical odds. Also confirmed the Reich Lab is working on a Bronze Age to Neolithic Italian sample. I noticed your pic has "Basal Eurasian" splitting into a "Basal Eurasian 3" and a "Basal Eurasian 4". Any idea about how closely related those two were in time? Would your tests filter out a Kostenki 14-type false signal? More specifically I am wondering if the CHG have something which is mistaken for near kin of the the BE 3 signal? All of the ancient populations in the analysis are separated to some extent in space and time, even those that have been shown to be closely related, so it's usually necessary to account for this problem by offering the algorithm more specific mixture sources than those that are available directly. Hence, the fact that the available CHG genomes don't perfectly represent the basal, CHG-related ancestry in Khvalynsk and Yamnaya shouldn't be surprising, because they're from individuals who lived thousands of years earlier. They're close, but far from perfect, and that has to be accounted for. I'm not really sure how Kostenki14 can fit into all of this, since it's older than CHG, but it probably does at some level.